London is one of the largest cities in Europe. It's vast with a population of more than 8 million. The city is made up of a group of neighbourhoods and districts that grew out of the original villages. Each have their own atmosphere and eccentricities, some chic, some boho, some full of student life and others upmarket. It's a multicultural city and it's this diversity that helps make it a vibrant city. 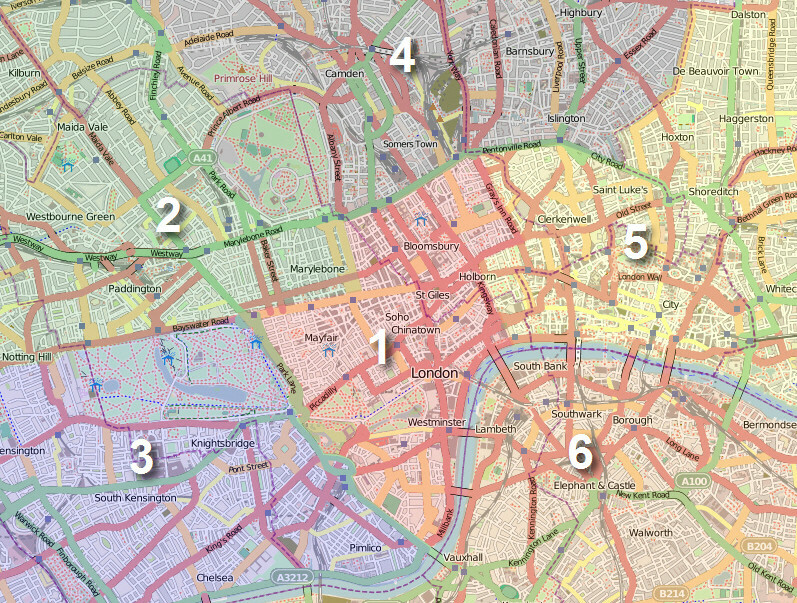 To help you discover all it has to offer we've divided the capital into seven different zones. read on and make the most of your trip. revellers and locals tend to give it a wide berth. The West End is well known as Theatreland, it's London's Broadway with mainly musicals on the programme. The Strand is a long and busy street full of the iconic red buses and black taxis. Don't miss Covent Garden. The covered markets, shops bars and restaurnats are very touristy but it's a must see for the street performers alone and it has a great atmosphere. Like most major cities, London has its won Chinatown nestled between teh cinemas and bars at Leicester Square and trendy Soho. There's more pubs than you can hope to visit here. Soho has a character all of it's own with a buzzing gay scene, clubs and restaurants. To the north you will find two relatively smaller districts, Bloomsbury (best known for the British Museum) and Fitzrovia. This area, especially around Charlotte Street, is wher ethe media companies and crowds are based. Areas in Central London: Soho & Chinatown, Bloomsbury, Covent Garden & the Strand, Westminster, Fitzrovia, Mayfair. The area west of Central London is famous for it's green spaces, upmarket shopping streets and residential areas. You'll find Hyde Park, Kensington Gardens and Holland Park, New Bond Street, Marylbone High Street and Baker Street and the areas of Bayswater, Kensington and Notting Hill. Take the train from Heathrow Airport to London's Paddington Station. West London is very wealthy and that's reflected in the shops, restaurants and beautiful houses set in and around wide avenues and large parks. If you book a package you're likely to end up in a hotel in Bayswater. There's lots of them in white Victorian houses and whiel a good lcoation there's nto much to do in here. However, nearby Notting Hill, made famous for the box offcie hit film of the same is a neighbourhood full of bustling streets lined with cafes, bars, restaurants and trendy boutiques. The famous Portobello Road market is also here. and trendy shopping in the Kings Road. There's also top attractions such as Buckingham Palace, Westminster Abbey and Big Ben. Travel from Gatwick Airport to Victoria Station. There's a rich ethnic mix in North London and big differences between the rich and poorer areas. It's not the smartest district with the exception of Hampstead and Primrose Hill. Regents Park is a small neighbourhood close to Camden which is famous for it's market. Camden is multicultural and has an alternative atmosphere. Amid the buzz you can find a peaceful spot overlooking the Regent's Canal. The canals give the area its name, Little Venice. You can travel by Eurostar to St-Pancrass station to reach this district. Much of East London has shaken off its bad reputation and emerged as one of the city's hippest districts. Many of the factories have been repalced by trendy businesses and the working class homes have been developed and renovated into hip homes for professionals. The crime and gang culture is stiull present in Whitechapel and Hackney but visitors shoudl use the same commensense when visiting these areas at night. The relocation of factories, the arrival of the DLR (Docklands Light Railway) and the devleopment of Canary Wharf has helped transform neighbourhoods. Spitalfields, Brick Lane and Shoreditch into trendy, arty neighbourhoods. There's some great markets worht visiting here too. Reach this district from Stansted Airport by train or bus to Liverpool street station. Today south of the River Thames there's some popular areas such as Southwark, home to London Eye, Tate Modern art gallery and the Millennium Bridge. A highlight is the Thames Walk, a long, wide continuous footpath along the river. An absolute must is Borough Market. This market started as a small organic market but has become a huge crowd puller. Canary Wharf gives you a sense of New York with it's tall towers and classic, contemporary architecture. It's a business district with many of the big banks talking office space. There's lots of expensive, luxury appartments with excellent transport links to central London on the Jubilee line and the Docklands Light Railway. More information on Canary Wharf. Greenwich is famous for Greenwich Mean Time (GMT) but this is also a place known for it's village atmosphere with trendy bars, cafes and restaurants along with some lovely boutiques. The following overview contains detailed information on the different neighborhoods. Click on a district for more information. Bayswater & Paddington are packed full of tourist hotels. Paddington station is easily reached from the airport on the Heathrow Express. Bermondsey has undergone a transformation in recent years and is now a hip London neighbourhood with great bars and restaurants, market and lots of design studios and galleries. Bloomsbury is a quieter neighbourhood with character. It boasts a treasure trove of bookshops and the British Museum. Brixton is a vibrant and colourful neighbourhood and an alternative place to visit away from the usual tourist trail. Camden has an alternative culture and great markets but get's very busy . Combine it with a visit to Regent's Canal and Little Venice or picnic at Primrose Hill which has a charming village feel despite the fact it's in the city. Canary Wharf is the stylish financial district with towering offices, expensive apartments and a Manhattan skyline. Chelsea is a trendy district and home to the famous King's Road. Artists and poets helped create it's Boho atmosphere as far back as 1880. Clerkenwell is a neighbourhood with a history which is enjoying a revival, attracting a creative crowd. Restaurants, bars and clubs are springing up amid the traditional businesses and homes including London's oldest meat market, Smithfields. Covent Garden is a tourist hotspot, with cafes, bars and street performers entertaining the crowds. Seven Dials is a great little shopping spot and The Strand is home to Somerset House and major theatres. Greewich maybe famous for time (GMT) but there's plenty more to do and see here from the Cutty Sark to the Royal Park. Holborn is busy in the week with law firms and office workers adding to the buzz but at the weekend it's quiet. Pass through and stop for a coffee on your way to the British Museum or Covent Garden. Marylebone is a lovely place to shop and much more relaxed than nearby Oxford Street. It has a market selling clothes and food and a farmer's market. It's also close to tourist attractions such as Madame Tusaauds and Regent's Park, London Zoo. The name Mayfair is synonymous with money. Saville Row is famous for it's suit tailors and New Bond Street for its expensive brands. Nearby Regent's Street has more affordable shopping but it's busy. Notting Hill was made famous by the International hit film of the same name but there's more to this area than meets the eye, it has a rich history. Southwark is better known as South Bank and Bankside, home to the London Eye and the Tate Modern art gallery to name just a few of its many attractions. South Kensington and Knightsbridge are the playground of the rich and famous. Stately homes. upmarket shops inlcuding Harrods sit alongside London's great musuems which are free to enter. Spitalfields Market halls have been given a new lease of life. This area in East London is now one of the hippest with The Old Truman Brewery and Brick Lane creating a real buzz. The City of London is the financial heart. It's bustling with stockbrokers, bankers and business people all week but shuts down at the weekend. Visit St Paul's Cathedral and Tower Bridge. Wapping is a quiet area of refurbished warehouses now expensive apartments and since the 1980s is home to controversial Rupert Murdoch's News International media business. Walk the Thames Path and see where pirates were hanged up until 1830. Historic Westminster boasts the Houses of Parliament, Big Ben and Buckingham Palace.